We’re not that far into the merge, but we’ve already gotten one of the most hectic tribal councils we’ve seen in the show’s history. 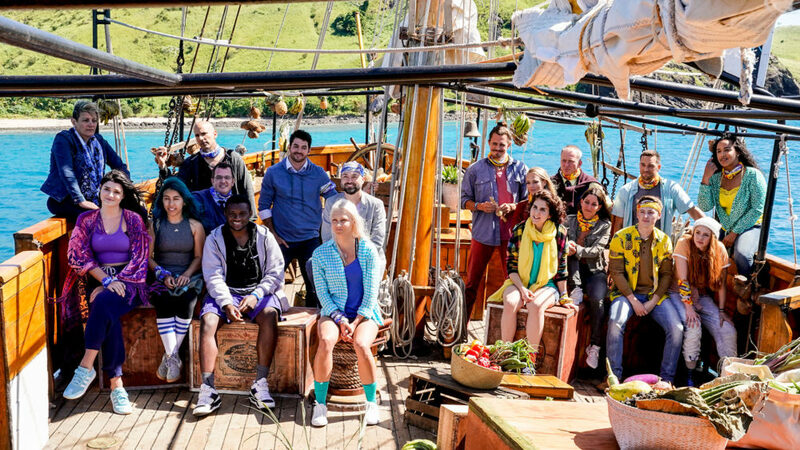 Here’s who got voted off tonight in episode 8 of Survivor 38: Edge of Extinction 2019. To cut to the chase, Julia Carter was the unlucky castaway who got voted off tonight in Survivor 38. After last week’s blindside against Eric, it was clear that Ron and Julie were on the outs of the Kama alliance. Immediately after the vote, Gavin approached Wentworth, Lauren, and Wardog with the proposal of forming a final six alliance with the four of them, along with Julia and Victoria. The six were in agreement. At the same time, Rick and David also made up and decided to stick together as a pair. They decided that their first course of action should be to re-establish trust with Ron and Julie to see if they could shake up the game going forward. Meanwhile, the core Kama alliance of Julia, Gavin, Victoria, and Aurora seemed to be in control. They had options with the split Lesu members, as well as the remaining Kama members on the outs who they could potentially pull back in. After Gavin won the next immunity challenge, he wanted to get David out because of his strong challenge performance. However, Julia had other ideas. She wanted to break up the tight trio of Wentworth, Lauren, and Wardog, and potentially get Wentworth out. On the other hand, the Lesu three weren’t so keen on the idea of voting out David, as they didn’t want the Kama members to get back together again. They floated the idea of voting out Ron, since he was a strategic threat and had acted as the leader of their alliance for a while. Meanwhile, Ron and Julie were at a loss about what to do. They were approached by the Kama members to take out either David or Wentworth, but Julie had lost so much trust with them that she was already considering flipping to another side. Still, the Kama members reassured them that the plan was on, and they decided on voting out Wentworth, who, at this point, was still under the impression that David was going home. She’s Lost Her Damn Mind! During tribal council, Julie had a breakdown, where she revealed that she didn’t have any confidence that the plan she was told was going to actually go through. This set off alarms in Wentworth’s head, as she’d already gotten a fishy feeling from the Kama group. Wentworth asked Julia if they were still good, to which she replied yes. But then, Rick notices that side conversation and points out that Julia already has a plan set with Wentworth, so clearly someone’s getting blindsided tonight. And then Aurora goes ahead and starts this whole speech about how there are probably multiple plans being talked through for the vote, and no one really knows what’s happening. She goes on to say that if the Lesu members were smart, they’d put aside their differences and work together. This then causes Rick to make a plea to everyone who isn’t Gavin, Aurora, Victoria, or Julia, and says that they should, in fact, band together to vote one of them out. Except Gavin, who won immunity. This results in pandemonium at tribal council, as everyone starts getting out of their seats to discuss new plans. Wardog pitches Aurora’s name to Ron and Julie, and says it’s up to them which of the Kama girls they want to vote out. Julia and Wentworth are back together, discussing the David plan yet again. Rick goes to join Wardog and Lauren to reinforce the pitch of voting out a Kama girl. And David speaks to Wentworth again, and finds out that she was planning on voting him that night, but he becomes open to working with her again. Finally, everyone eventually settles down, and it’s time to vote. Save for Julia and Aurora, who voted for David and Wentworth, everyone else voted for Julia, sending her to the Edge of Extinction. Also worth noting that David and Rick combined their halves of the hidden immunity idol, and opted to play it for David just to make sure everything went smoothly. That’s all you need to know about who got voted off tonight in episode 8 of Survivor 38: Edge of Extinction (2019). Be sure to search for Twinfinite for more Survivor-related content.